When we first announced that we were putting our sons in private school, the reactions were mixed. My neighbor quit giving me the outgrown dress clothes from her boys. She said if we could afford private school then we could afford to buy our own dress clothes. My friends who work in the local school district were hurt. They felt that I didn’t trust them with my child. My friends who home school were disappointed. They told me I was taking the easy way out. My friends who put their kids in public school wanted to know what they didn’t know about. My family wanted to know how I could afford it. For what it’s worth, I don’t believe that there is one perfect choice for all families. I’m certainly not trying to say that every child belongs in private school. I don’t even think there’s one single perfect choice for any child. In our home, it’s a year-by-year assessment for each child. Our private school has a single standardized test each year. It’s an achievement test they take in the spring. Other than making sure the kids know how to bubble in an answer and remember to eat breakfast that week, there isn’t much fuss about the test. Our school has closed walls and small classes. The local public school is open concept with almost twice as many kids per teacher. My quirky son would struggle in that environment. Our school is a family. It’s a K-12 school. I love seeing the high school kids helping at field day in the spring. I love that the fifth grade teacher knew my kindergartener by name and knew enough to ask me how he was doing with a specific problem. When she said she’d been praying specifically for my son, I went weak in the knees. Our school can and does talk about God. When the kids get in a disagreement, it goes way beyond needing to apologize to each other. They have to PRAY for each other. Hearts change. My kids see a consistent approach to discipline between home and school and church. They see consistent (but not identical) values between families. They notice that stuff. Our school respects family time. They don’t give homework on Wednesday nights to allow kids time to do the mid-week church thing. Homework the other nights is a minimal 10 to 20 minutes. Our school trusts me. If my kids miss school for illness (or whatever other reason I may choose), I don’t have to provide a doctor’s note. It’s my call. I don’t have to prove that they were sick. I don’t have to prove that they are well. If it was just the occasional day to enjoy the weather, I don’t even have to pretend. My kids are thriving. They have a solid academic foundation regardless of what the future holds. They have a solid spiritual foundation too. They are happy. They have friends that I’m happy for them to have. They are growing into confident and courageous young men. Houston Mom Blogger Susan Baker writes at ThisHappyMom and has a passion for encouraging weary worn out moms to find joy in everyday motherhood. She has two elementary school boys, one engineering husband, and one cat. She has a strange fascination for eggs, socks, and books. She spends far too much time on Social Media and at Target. She is crazy in love with her family. She serves an amazing God. She lives an ordinary life filled with wonder. Don’t miss out on our A Prayer for My Children printable! Just subscribe below and download it for FREE! I am glad you have landed on something that you really believe is best and recognize it ISN’T a one size fits all decision. Thank you for sharing your reasoning and your experiences! Looks like a private school was really the best choice for your family, and even though your neighbor was sour about it, it’s all about what is good for your kids. Thanks for sharing your story! Ditto. We feel the same way and for the same reasons. Excellent post!! How could anyone question your desire to have the very best for your kids? My girls are in a charter school, and for us, it was the absolute right decision. Anyone who takes your move for your children as a personal slight is missing the point! You are SO blessed to have a school like that for your children!!! Oh, how I wish I could send my kids to a school like that!! Nothing here that is k-12. I am tempted to continue the search after reading this, Susan. Chris, I live in Houston Texas. We have a huge number of schools to choose from. I had lost track of the idea that not everyone is so blessed. K-12 wasn’t a huge part of our decision. There were some other quality K-8 schools that we looked at. This one just happened to be closer and easier to drive to. There’s an amazing private high school that those K-8 schools informally feed into. That may be more of what you have available to you. It really is about making the choices that make sense for each child. I’m happy to answer questions about our experience when friends ask, but I never judge when they don’t make the same choices we do. I love that you’re homeschooling this year. Secretly, I hope that I get to do that one day. But for now… this is our choice. My oldest is in private school right now. We had the choice and this is where we felt she belonged, and where we felt we belonged. It’s not easy on the wallet but it has become a family to us. It’s not easy on our wallet either! 🙂 I can’t imagine not having our school as part of our life. We feel like we belong there as a family – I agree. This makes me wish that God was telling me to send my kids to private schools. 🙂 Your school sounds exactly what I want for my children. If the time ever came where I thought God was telling me to enroll them in private school, I would find a way to do it. As it is, I wish I could homeschool my middle schoolers because I am so unhappy with our school and the teachers. The reason I don’t is that my daughter needs to be taught by someone other than me. She fights me on everything and every school day would be a battle. If it is working for you, then everyone else should mind their own business. Your school sounds lovely. I totally understand! I can’t see any way I could homeschool my kids either! I really admire the women who can do that. The financial part is tough. We struggle. We’ve made some sacrifices. I drove the same car for 8 years and it was used when I got it. Writing those checks each month is NOT comfortable. It takes the same discipline and faith to write those tuition checks as it does to write the tithe checks to church. I’m sorry to hear that you are so unhappy with your current school. That’s tough on moms. It makes my heart hurt to think about for you. Just keep praying. God has a plan for you and for your kids. He knows what is going on at school and He knows your heart. My oldest is in private school because he felt lost in the crowd. It was his choice, not ours. 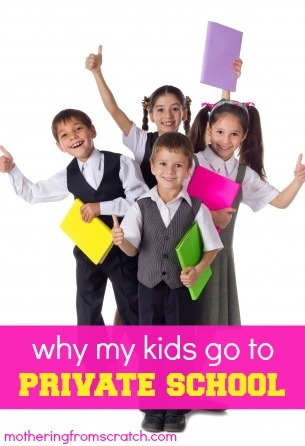 My husband and I didn’t go to private school…it wasn’t in our mindset. But I can see a difference in him. It was the right choice for him. It’s a struggle financially, but we are doing everything in our power to make it happen. My two younger children are in public school, and so far that is working out well too. The different vacation schedules throw me off though! Michelle, I know several families who do exactly what you do. They make different choices for different kids. I really admire that! I know from my friends that juggling all those different school schedules and cultures really does pose a challenge. Your son is blessed that you’re willing to take on that extra challenge (and the finances) to keep him in the right school for him!